What’s the lowdown? Omar S is one of Detroit’s hottest exports. He is the Henry Ford of underground, slightly avant garde techno and house. He is either producing or recording it for his own FXHE records or indeed spinning tunes all over the US and Europe. How did he get into the music game? A self taught musician, from an early age he tapped out tunes on his keyboard, learning as he went along. However, he wasn’t exactly playing chopsticks, he learned how to master the electric ivories by playing along to house anthems like ‘Jack your Body’ and ‘Can you Feel It?’. He then went on to become a DJ playing his first gig at one of Joe Claussell’s clubs in Manhattan. He continued to mess about with keyboards, recording and producing in his bedroom until 2001 when he put out a test press on his own label. The track was the now highly sought after ‘Omar S 001’. What happened next? It’s the stuff of musical fairytales. Upon hearing the track, record store owner/DJ Rick Wilhite asked Omar if he could take all the copies he had on him to sell in his store. When Omar went back to collect his money from the sales of the record, who did he bump into in the shop but none other than superstar DJ Theo Parrish (now a regular collaborator). Parrish was so impressed with the track he encouraged Omar to produce more. Responding with ‘Omar S 002’ and ‘Omar S 003’, his career as a producer took off at warp speed. Today he is one of the most sought after producers/DJs around. 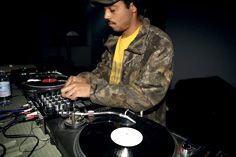 Omar S DJs at Subculture at the Sub Club, Glasgow, Sat 7 Jul. Glasgow's well-established house institution continues to reign supreme, with residents Harri and Domenic and occasional big-name guests.